Wow, an unsheathed belt axe just swinging right next to that perfect thigh…why does one need an axe in a high tech society anyway? Mr Tumnus always had it bad! She looks very, very plastic. That being so, she’s probably a highly sought-after collectable. Are those two gents in the background disembarking from a boat? The other cover in the double. The Green Millennium 1954 Lion Library PB – google for some awesome 50’s cheese. The funny thing is, all three covers are reasonably accurate accounts of the contents. The cover artists are not credited. 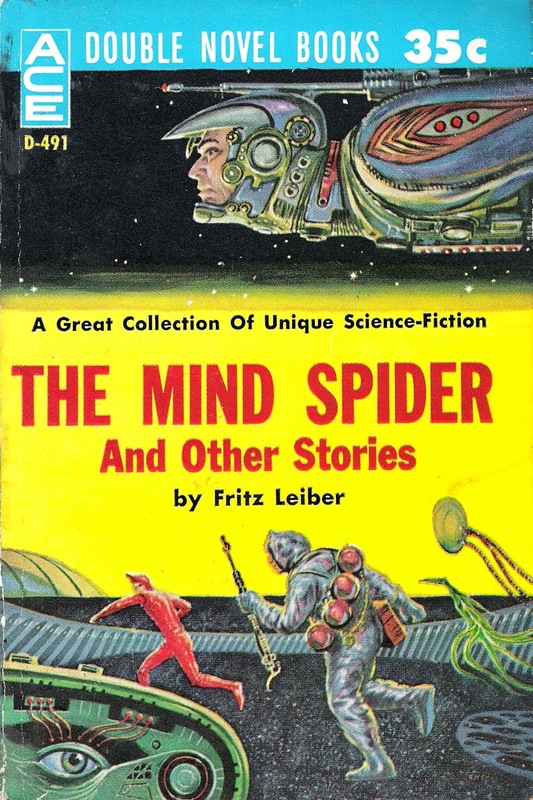 EMSH is on the cover of The Mind Spider, lower right corner. 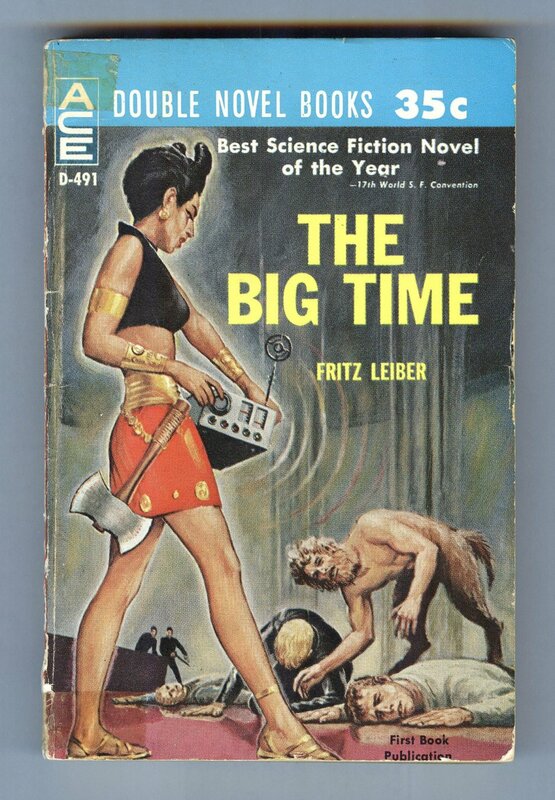 The ACE Image Library credits Emshwiller with the cover for The Big Time as well [looks more like Valigursky]. BTW, the original story and art from Galaxy Magazine are available on the Internet Archive. Greta Forzane/Amy Winehouse looks identical to this cover but the original art is credited to (Virgil) Finlay. I realize this is nitpicking compared to all the rest of the glorious cheesiness of this cover, but her torso is way too skinny for her internal organs. It would seem you are correct, @DSWBT: she IS made of plastic. @Anna T.—not only plastic, but magnetic! 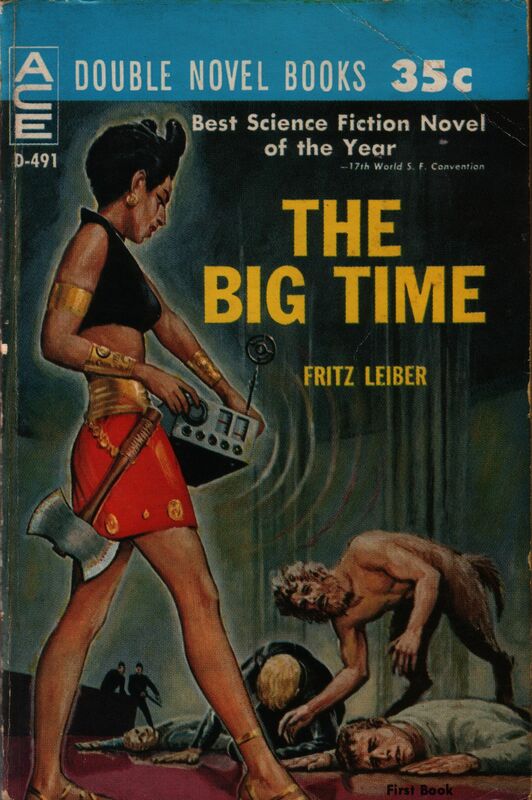 I mean, judging from the angle of the axe. What do you think? Did she get it from her boyfriend, or is she merely following the crowd? LADIES, ARE YOU BOTHERED BY FAUNS? 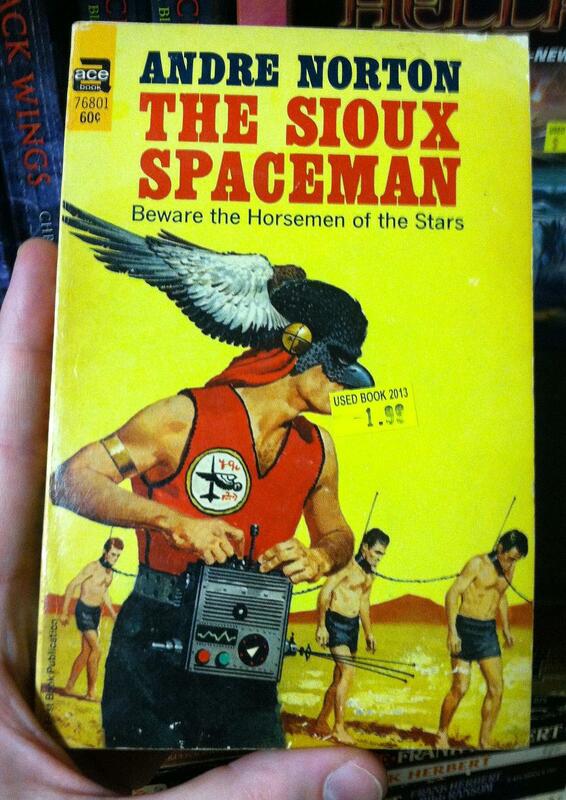 The Faun-icator 3000® delivers powerful ultrasonic frequencies, disorienting invading fauns while you don’t hear a thing. The unpleasant sound ricochets off walls and other solid objects, neutralising fauns on the spot. Also effective on random men. Next week: Sheena Easton really plays that axe! Phwoar! Check out her axe-wound! Needs a ‘piercings’ tag, kind wizard. These two have been shopping at the same Radio Shack. @DS—oops, my bad! You were all over that one way back when.